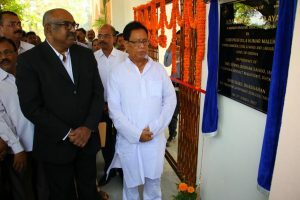 Kamakhyanagar: The Model Schools (Adarsha Vidyalaya) at Kamakhyanagar a constructed by Tata Steel were inaugurated today by Mr. Prafulla Mallick, Hon’ble Minister, Steel & Mines, Government of Odisha in presence of Mrs Rupa Roshan Sahoo, Collector ,Dhenaknal and Mr. Sunil Bhaskaran VP Corporate Service, Tata Steel . Tata Steel has spent approximately Rs 4.57 crore for the construction of the model school and provided the required classroom infrastructure as well. Built by Jamshedpur Utilities and Services Company (JUSCO), a subsidiary of the company, the two-storey school building is spread across 25,000 square feet built up area. .
To make quality education infrastructure available to students in far flung areas of Odisha, Tata Steel has signed MoU with the State Government to construct 30 model schools across the state. This initiative by the steel major, is part of the Government of Odisha’s grand plan of setting up Model Schools (Adarsha Vidyalaya) in each block within the state. . While three schools (Danagadi , Kamakhyanagar and Nayagarh) are ready, 11 schools are under construction. Tata Steel aims to complete building and hand over the schools to the government by end of 2018. The Model School (Adarsha Vidyalaya) constructed by Tata Steel at Gohirapatuli in Ranipada Panchayat under Danagadi Block in Jajpur district was inaugurated on 23rd December 2016. Local villagers, PRI members, school students, government functionaries, officials of Tata Steel and media persons joined the inauguration function.